A 48-year old woman was referred to us for evaluation of cardiac murmur. Her chest skiagram showed dextrocardia [Figure 1]a and the electrocardiogram revealed a normal P-wave axis, right upper QRS axis. The transthoracic echocardiogram showed situs solitus and dextrocardia. She also had severe infundibular pulmonary stenosis and a hypoplastic right ventricle with intact interventricular septum [Figure 1]b and c. The atrioventricular and ventriculoarterial relationships were concordant. The left atrioventricular valve was normal, crossed behind the right valve, and opened to the morphological left ventricle, on the right side. The right atrium was dilated and opened through a narrow tricuspid valve into the trabeculated morphological right ventricle on the left side [Figure 1]d-f and [Video 1]. Cardiac magnetic resonance imaging (MRI) confirmed crisscrossing of the atrioventricular valves [Figure 2]a-g. 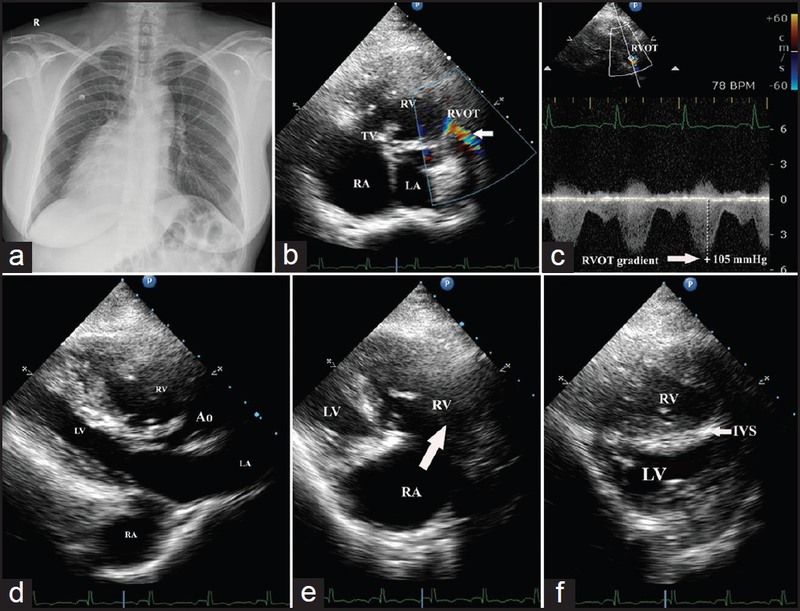 Figure 2: Cardiac magnetic resonance images showing crisscrossing of atrioventricular valves (a), (b) Right atrium connected to the right ventricle (arrow). (c) Left atrium connected to the left ventricle (arrow). (d) Right atrium connected to the right ventricle (arrow). Left ventricle and aorta (Ao) are also shown. (e) Dilated right atrium connected to the right ventricle (arrow) in a sagittal cut section. (f) Ascending aorta (AA) arising from the left ventricle in a sagittal cut section. (g) Pulmonary artery (PA) arising from the right ventricle in a sagittal cut section. The ascending aorta, aortic arch (AoA), and descending aorta (DA) are shown. An angiocardiogram revealed that the dilated right atrium connected to the morphological hypoplastic right ventricle on the left side, which subsequently connected to a posterior pulmonary artery, thus confirming the crisscross atrioventricular relationship. The left ventricular angiogram showed an intact interventricular septum [Video 2]. On review of the literature, only 150 cases of crisscross hearts have been reported. Nearly all the cases had associated ventricular septal defect, with only 50% having pulmonary stenosis. Previously, cases of crisscross heart with intact ventricular septum have been reported by Fontes et al. and Alday et al. , Our case is unusual in that the patient had dextrocardia and an intact interventricular septum. 1. Yang YL, Wang XF, Cheng TO, Xie MX, Lü Q, He L, et al. Echocardiographic characteristics of the Crisscross heart. Int J Cardiol 2010;140:133-7. 2. Fontes VF, de Souza JA, Pontes Jùnior SC. Crisscross heart with intact ventricular septum. Int J Cardiol 1990;26:382-5. 3. Alday LE, Juaneda E. Superoinferior ventricles with Crisscross atrioventricular connections and intact ventricular septum. Pediatr Cardiol 1993;14:238-41.